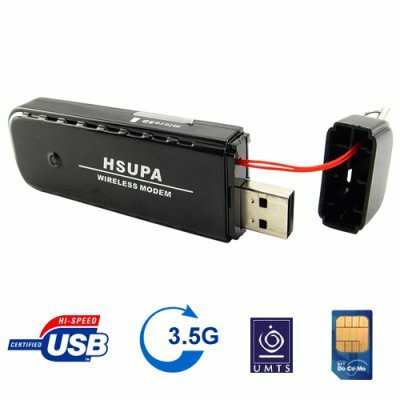 Successfully Added HSUPA Wireless USB Modem for Laptops to your Shopping Cart. HSUPA Wireless USB Modem for Laptops for surfing high-speed wireless internet on your laptop. Setting up and using this HSUPA wireless modem is quick and easy. Just slip your SIM card into the modem and connect the modem to a free USB port on your computer. Your computer will detect the modem and begin installing the software from the USB stick automatically. The software has preset configurations for networks all over the world and will locate available networks in your area automatically. You can also manually configure your network and connection settings. The user friendly interface makes configuring your network and managing your SMS messages and phone book quick and easy. Where can I find a list of HSUPA networks in my area? Do I need any extra software to use this HSUPA wireless modem? I'm impressed in a way I never though I would be with a modem. Flawlessly designed software - Mobile Connect - and drivers installation (first use only). The software is able to detect the carrier and auto-connect using the correct profile. This should work for any major worldwide carrier; if not a quite easy and straightforward manual configuration of a new profile gets you surfing in no time. More stable and reliable than most modems sold or bundled by Vodafone in Europe and no contract either. SMS and Phonebook features work great as well. On the down side it's not supported (yet) in Linux; otherwise it would be perfect (5 stars).